I first encountered the work of Clive Barker back in 1986 when a friend gave me the first three paperback volumes of The Books of Blood for my birthday. I was instantly hooked, reading all fifteen stories in a few days. Actually, it was the fifth story in volume one that really hooked me – “In the Hills, the Cities”. I’d never read anything like it and the combination of acute psychological observation with an epically insane concept rendered in precise, literate prose made him an instant favourite. I quickly bought the other three volumes, and although there were inevitable variations in quality, I sought out everything he published over the next few years. The Books of Blood are dense condensations of a ferociously fertile imagination. Many of the novels which followed seem less satisfying to me; in fact, I couldn’t even get through some of them – the epic fantasies Weaveworld and Imajica were the only ones which had the same impact on me as the stories. Then, perhaps predictably given the visual power of his writing, Barker tried his hand at movie-making. Well, actually, he had made a couple of arty experimental films in the ’70s (Salome, 1973, and The Forbidden, 1978), but his debut feature was Hellraiser (1987), based on his novella “The Hellbound Heart”. Despite budgetary limitation, it was an assured piece of work which managed to transfer his distinctive blend of imagination, gore and original ideas to the screen fairly intact. But Hellraiser was actually the third feature adapted from Barker’s work. A chance encounter with George Pavlou, a man who’d made some shorts and produced television and commercials in England, led to Barker writing an original screenplay – Underworld (aka Transmutations, 1985), which Pavlou directed. Despite not very good results, Barker then wrote a script based on one of the stories in the third volume of The Books of Blood, “Rawhead Rex”, which was again directed by Pavlou. 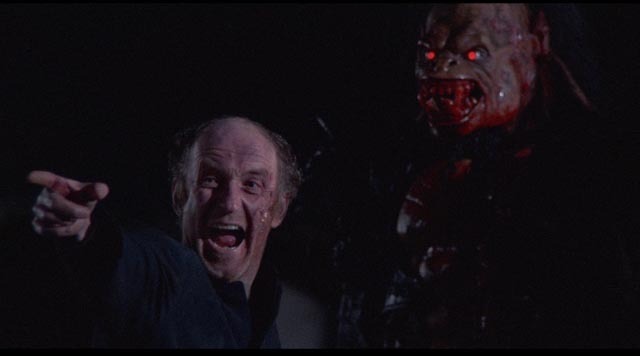 Rawhead Rex (1986) is narratively faithful to the story, but Pavlou was unable to bring out the underlying moods and meanings inherent in Barker’s prose. Here, as in many of the stories, a primal force impinges on a mundane modern world populated by people who have lost any attachment to spiritual or magical powers. Rawhead is a monstrous immortal creature who was subdued and imprisoned in the Dark Ages in a farmer’s field beneath a stone carved with powerful symbols. When the current farmer, clearing his land, removes the stone, Rawhead wakens and finds himself in a strange world which has forgotten him. He’s not exactly a deity, rather a primal embodiment of appetite; he roams the English countryside slaughtering animals and people alike for food, and seeking new acolytes to worship him. As Rawhead slaughters a farmer and his family, people begin to sense his presence – particularly the Verger of the local church, who quickly becomes a willing servant. 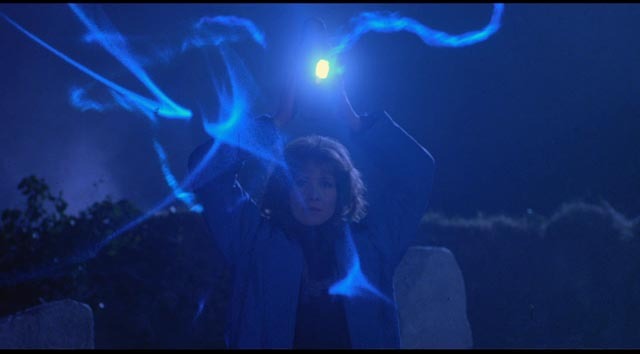 Police investigate the rash of brutal killings; various villagers become aware of the supernatural creature attacking them. 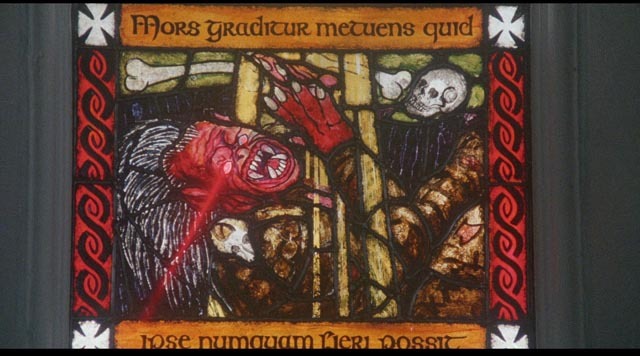 The power of the Church is useless against him – he predates Christianity – but it turns out that this representative of savage male power is no match for the Goddess; hidden inside the Church altar is a neolithic stone figure of the female principle which, in the hands of woman, generates an extended display of really cheesy optical effects which subdue Rawhead. But of course, as an ’80s horror movie it has to end with a final jump scare which illogically negates what we’ve just seen. Barker raised the bar with Hellraiser the following year, perhaps having realized that a) Pavlou was not actually a good director and b) perhaps he himself was the best equipped to handle his own idiosyncratic material. He subsequently provided the story for Hellraiser 2 (1988), but without his involvement as scriptwriter and director the results were disappointing. (It was the directing debut of Tony Randel, who had contributed to the editing of Hellraiser.) Barker’s next project, Nightbreed (1990), ran into problems with a distributor which didn’t understand his particular type of fantasy and reworked the film in an attempt to make it more marketable as a standard slasher. (Barker finally got to complete his own version in 2014.) Then two years later, along with a third kick at the Hellraiser cat, one of the most commercially successful Barker adaptations appeared. English filmmaker Bernard Rose wrote and directed one of the more prestigious Barker adaptations, Candyman (1992), based on “The Forbidden”, one of the stories in volume five of The Books of Blood. In terms of production values and craft, this was a definite step up from Pavlou’s work and the Hellraiser sequels. 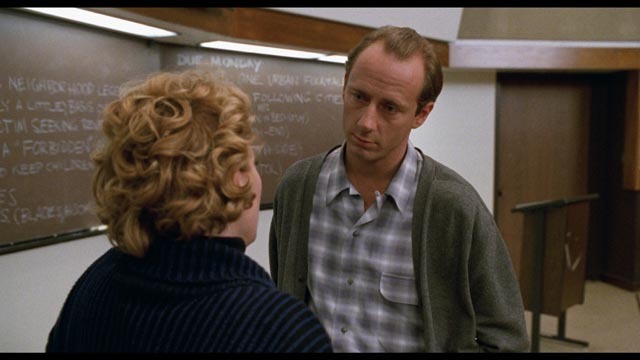 Best known at the time for his third feature, Paperhouse (1988), Rose obviously took Barker’s work seriously and his adaptation follows the original story quite closely. In that story an academic researcher is drawn to a rundown housing project to study the ways in which rumours spread among the inhabitants, rumours focused on fear and violence (someone was brutally killed a few streets over, someone heard it from someone who knew someone who knew the victim) – rumours which shift and evaporate when traced to their supposed source. And yet the violence described in these rumours establishes a tone of desperation which provides some kind of meaning for these severely constrained lives. But as the researcher’s investigation casts doubt on the factual basis of these rumours, an ancient force is aroused – an embodiment of rumour known as the Candyman, which lures and kills children. The inhabitants of the estate embrace the horror because it adds a frisson of excitement to their mundane lives; that the deaths are now real is the fault of the researcher, whose rationalizations have begun to undermine belief in the Candyman, requiring him to provide fresh proof of his existence. Once again, Barker conjures up ancient forces which challenge the skepticism and complacency of the modern, overly rational world. The original story is set in a bleak housing estate in northern England and incorporates issues of class. Rose’s adaptation relocates it to the United States, specifically the Cabrini-Green housing project in Chicago. This complicates class issues with race. Rose further complicates things by giving the Candyman a specific history – no longer an ancient, abstract force, here he is Daniel Robitaille, the son of a slave who rose to prominence in the late 19th Century as a talented artist. Hired to paint a white woman’s portrait, he fell in love with his subject and fathered a child. The woman’s father led a lynch mob which cut off his painting hand, covered him with honey and left him to be stung to death by a swarm of bees. His body was burned and the ashes scattered where Cabrini-Green was eventually built. 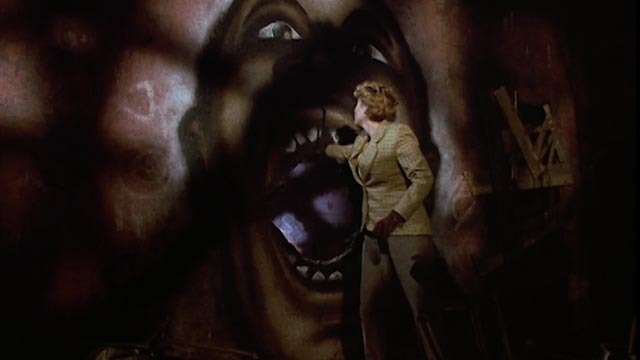 The specifics of this backstory provide the movie’s various visual motifs: the Candyman has a deadly hook in place of a hand; bees buzz when he’s near, eventually revealed swarming in his rib cage; and the walls of his lair in an abandoned highrise in the projects are adorned with paintings depicting his story. In Barker’s stories horror is thematic, the details of plot used to evoke something more abstract – his main theme being the illusion of modern life, reduced to a material existence which has forgotten the mysteries which lurk beneath the surface. Our sense of security has been bought at the cost of willfully blinding ourselves to a darker spiritual reality. Rose’s adaptation of “The Forbidden” diminishes Barker’s theme by turning it into a story about a malevolent ghost driven by human desires, a need for revenge. But this change is problematic because the Candyman, a victim of savage racism, himself victimizes the Black inhabitants of the projects, who themselves are already victims of a racist culture … and further, he wreaks violent havoc on their lives with the aim of repossessing a lost white lover. 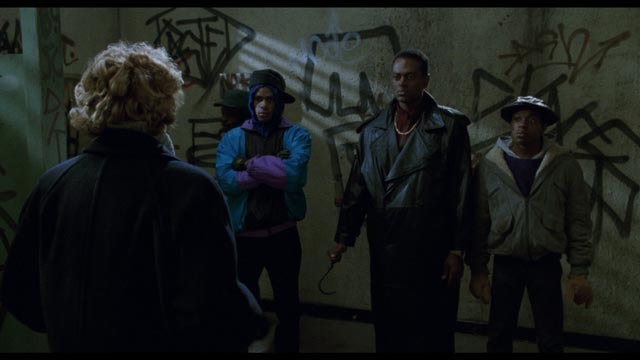 The imposing presence of Tony Todd as the Candyman can’t entirely disguise the film’s problematic racial politics. This is the story of a Black monster determined to possess a white woman and destroying other Black lives to further his aims. Despite the overall narrative fidelity of the movie, Barker’s original theme is all but buried. Beyond the problematic racial element, however, Rose’s adaptation is a polished and effective horror movie with a better-than-average cast (Virginia Madsen as the lead, Kasi Lemmons as her unfortunate Black friend, Xander Berkeley as her unfaithful husband, and Tony Todd as the imposing monster) and excellent photography by Anthony B. Richmond which makes the most of the Cabrini-Green locations and some very impressive sets built in L.A. An extra touch of class is added by a Philip Glass score. Shout! Factory gives Candyman the deluxe treatment with their new Collector’s Edition Blu-ray. There are two different cuts – theatrical and unrated, both 2K restorations from 4K scans of the original camera negative – with multiple extras spread across two disks, including three separate commentaries on the theatrical cut and multiple featurettes on the production and Barker’s writing, and perhaps most interesting an interview with Black authors Tananarive Due and Steven Barnes who speak of their conflicted feelings about the film and its depiction of race; they admire it for bringing race into a mainstream horror film at a time when that was rare, and particularly for Todd’s authoritative performance, but speculate about what might have been different if the project had been made by a Black director. Apart from a seemingly endless string of mediocre and pointless Hellraiser sequels and two Candyman sequels, there have been surprisingly few films based on Barker’s work – and none based on any of the novels, though perhaps that’s not surprising; most of them would require at least a mini-series to accommodate their large-scale narratives. By far, the best since Hellraiser and Candyman is Ryûhei Kitamura’s underrated Midnight Meat Train (2008). This entry was posted in Commentary, Review and tagged Adaptation, Arrow Video, Blu-Ray, Directors, Horror, Writers. Bookmark the permalink.